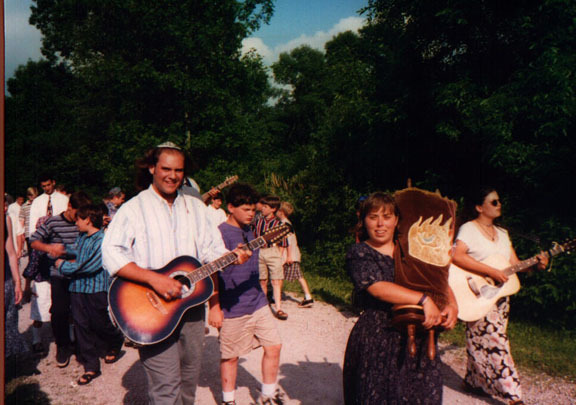 Aaron's experience includes songleading for services and song sessions at synagogues, retreats, hillels, and summer camps, leading music for Shabbatot, Havdallah, b'nai mitzvah, brit milah ceremonies, weddings, and countless informal occaisions. What Aaron loves most is to lead others in song. 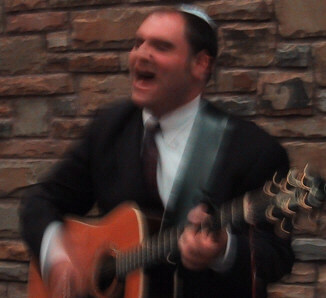 In addition to an extensive knowledge of Jewish music from the Reform movement, Aaron's repretoire includes countless traditional Jewish melodies, and American and Israeli folk tunes. 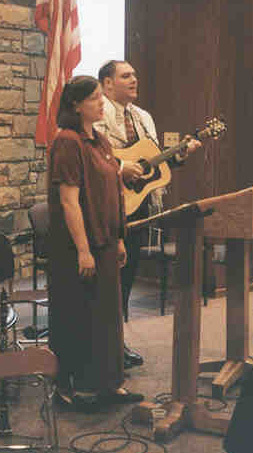 Recently, Aaron and his wife Jennifer have led several services as a duet, singing classic Reform melodies as well as NFTY favorites. 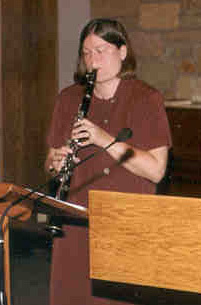 In addition, they do a 'Klezmer-style' guitar and clarinet duet of Klezmer, traditional Chassidic, and Israeli melodies, which is especially appropriate for Torah processions and 'chasers' at the close of the service. Pictures of Jennifer and Aaron leading music at a Bat Mitzvah ceremony, courtesy J. Glaser. References are available upon request. For information about booking Jennifer and Aaron as song and music leaders for your simcha, or booking Aaron as a songleader for your occasion, please email azs@aaronstevens.net. 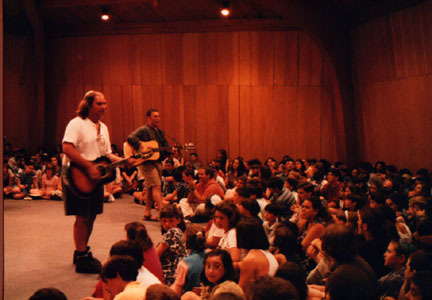 Aaron spent the summer of 1996 as a songleader in Kibbutz HaTzofim at Olin-Sang-Ruby. Without question, this was most meaningful and fulfilling summer of his life, and where he learned the most about songleading. Aaron includes among his mentors from OSRUI Debbie Friedman, Cantor Jeff Klepper, Rabbi Michael Weinberg, and Donny Maseng, each of whom has played an important role in shaping his songleading style and homing his musical skills. Here's a picture of Kibbutz HaTzofim as we welcome the Sabbath with our kaballat Shabbat procession. Aaron spent two years as songleader for the IU Hillel Jewish sutdent's movement in Bloomington, Indiana. 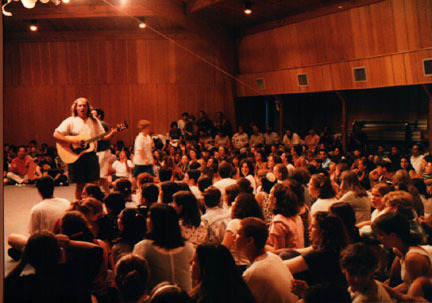 During the Spring of 1997, he co-led the Bo Nashir recording project, sponsored by the Helene G. Simon Hillel Center at Indiana University. 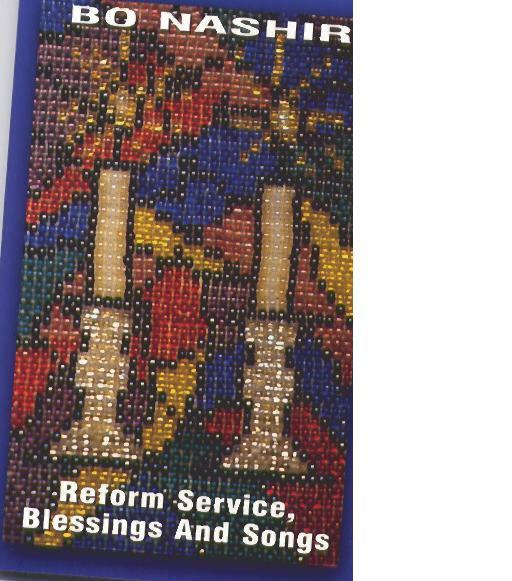 Bo Nashir (come, and sing) is a recording (two tapes) of all the music sung at Hillel, and was created to be a learning tool for students new to Hillel to learn the melodies and customs that created our way of celebrating Judaism and Shabbat.